New Winter Collection Just in time for Holiday Gifting! I can hardly believe it’s the last weekend before Christmas, but am so excited to share a few pieces of news with you all. First off, we recently launched our new and improved website, including a new addition to the EH Floral delivery repertoire: The Seasonal Collection. 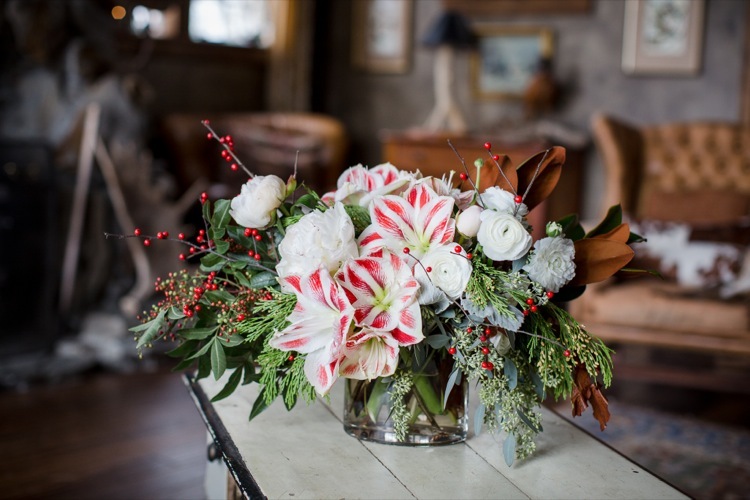 The Winter Collection includes a nice variety of floral arrangements for any type of occasion, as well as some holiday treats- like pretty red and white centerpieces, custom wreaths, and a very classy Holiday Gift Basket featuring local products like Landaff Creamery Cheese. For the winter, we’ve been getting gorgeous greenery (magnolia & cedar) from The Rocks Estate in Bethlehem. These look great in our custom wreaths and garlands that we make by hand here at the studio. It’s not too late to place an order for your holiday decorations, but call soon to ensure timely delivery! And, if you’re looking for a last-minute gift idea that will last long after the season is over, Flower Subscriptions are a great option, especially for people that don’t want more “stuff” in their lives. Subscriptions are customized to be delivered as frequently as you choose. We’ve been providing this service to local businesses for a while now, and they’re catching on for private home delivery too. Because like who doesn’t love to receive fresh beautiful flowers every couple of weeks? Wishing you a Warm and Happy Holiday!